Chicago Sporting Event Transportation - Proud Partner of the World Champion Chicago Cubs - Top Fleet Limo ~A Chicago Limo Service. Chicago Bears, World Champion Chicago Cubs, Chicago White Sox, Chicago Bulls, Chicago BlackHawks, Chicago Fire, and more! 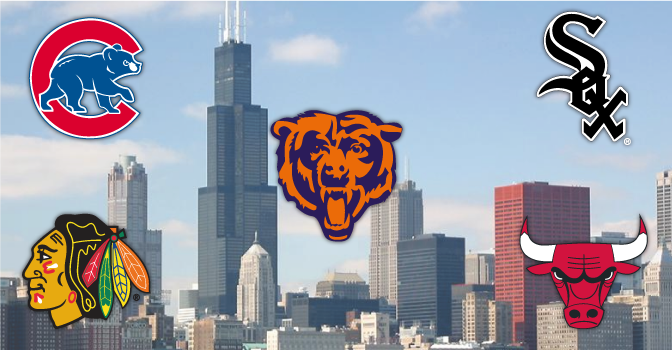 As diehard Chicago Sports Fans ourselves, we will provide you with a comfortable, fun ride to any of our home venues. Getting to and from games in Chicago can be a hassle with expensive parking and crowds. Using a Chicago sporting event transportation/limo service frees you up from parking hassles, gives you door-to-door service and allows you to relax and drink responsibly with friends. We can accommodate both small and large groups with traditional black car service , Chicago party buses or you can choose from medium-size luxury vans or large coach buses great for lots of people and long distances for those away games. Top Fleet Inc. also provides transportation for your sporting league needs. Our vehicles travel over state lines so no destination, or game, is out of our reach. Let us know how we can help suit your transportation needs. Don’t forget the casinos in Indiana! We’ll take you there too.